Two iconic spots on Grand Cayman are both across the north sound from West Bay where our tourist and hotel hotspot has formed, and very likely where most of you, our stay over island guests, will be calling home during your stay. 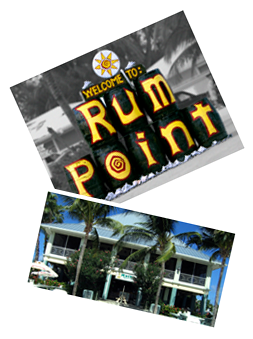 So to visit either Rum Point or Kaibo Yatch Club it’s a basic choice in the past of hire a car and drive, or a very expensive taxi ride. However now there is a much better option, we run PM boat trips out to both destinations all week, we pick you up , take you to our dock and take you across the north sound on our fast north shore boat, drop you off on the dock at your location for 3 hours so you can enjoy the sights, sounds, food and drinks available at these fantastic destinations. 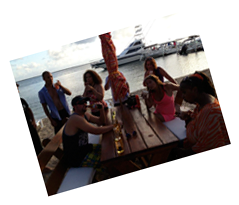 Then we collect you on the boat to return back to the Barcadere; then you have the options of joining us at the Barcadere and the fabulous menu, or we will drop you back to your resort in plenty of time to catch the west bay sunset. Additional information on the destinations and what you can do and see while there, departure times, return times and booking information is contained for you there but you can also just call the number above to book any of these or if you have any questions. 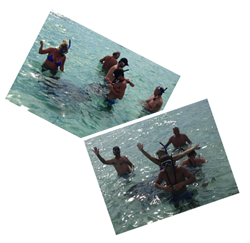 A must see and do for anyone visiting Grand Cayman is a Sting Ray City visit. We have a number of options for this excursion but the main trip starts with us picking you up at your resort and taking you to Barcadere marina where the boat leaves and take a ride out to either the Sandbar to meet the rays or our fringe reef snorkel site, which one we take first depends on how many boats are on the sandbar as less boats means more rays each so we adapt the stops to give you the best experience at each spot. Either way you get a great time with the rays and a fabulous snorkel site to get the best of the north sound fringing reef and the colourful reef fish that live there. We also offer then the option of a second snorkel site should you want to stay out on the water, or a stop into the beach bar at Kaibo for snacks, drinks and a gorgeous tranquil beach to catch some sun and just relax to finish the day before the boat ride back to the Barcadere. We also offer snorkel trips to the wreck of the Kittiwake depending on numbers we can take 8 snorkelers for a 2 stop trip taking in the wreck then a reef, or we are happy to take snorkelers on the same boat as divers for any trip AM or PM but this will be at the discretion of our schedule of the numbers of divers already on the boat on that day, as everyones comfort and safety comes first, of course if the group on the boat want to bring additional snorkelers along again depending on numbers, that will be easy to organise. 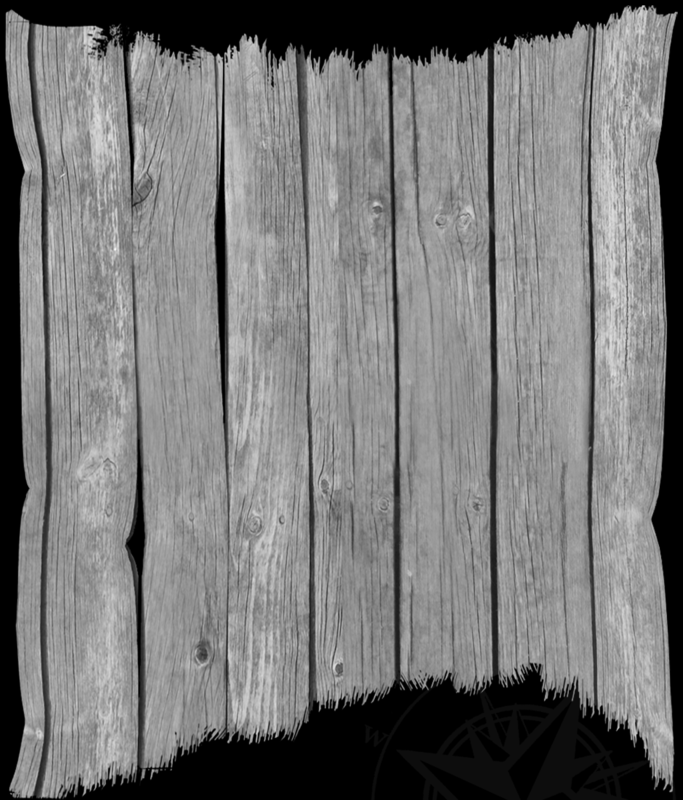 Give us a call, e-mail or drop us a line on Facebook and we will find a way to get you out there during your vacation, we are very flexible and able to cater to many, many different options for you. In addition to our Stingray City sandbar snorkel tours, we also offer the diver version of the Sting Ray encounter program at Sting Ray City deep. This is available to qualified divers or those on the Discover Scuba program as maximum depth is only 12 feet. The site is in the North Sound right next to Sting Ray Channel on the fringing reef. We run this trip from the Barcadere 8AM and 1PM to order and we take 6 divers, but can allow a maximum of 8 divers, for this regular trip. The boat heads out to the moorings and ties off on either East or West site bouy, you will then get a full briefing on how to feed and interact with these friendly creatures on the dive. Once the squid banquet is over we can then head to finish the dive on the close by fringe reef and take a look at all the corals and reef fish that live on the edges of this site. 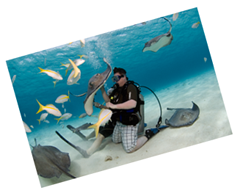 This is a fantastic encounter for all experience levels, from complete novice to seasoned diver, as there are a limited amount of opportunities to interact with Rays on Scuba in such numbers, its a must do for any Cayman Islands vacation. Also we can combine this with a sand bar stop, in this way divers and non divers both get to see the rays on the same trip, and non diving passengers can snorkel the dive spot due to the shallow depth. We can make a full afternoon of the trip with a stop after at one of North Sounds great docked restaurants if the group also wants to grab a meal or maybe just drinks. We can tailor trips to suit and offer many stop off options.